RoadRunners is a single-page music theme for WordPress. You can use it to store, update, and display information on upcoming gigs and artists. With its sleek, flat design and unique effects, its sure to impress your visitors! This theme is useful if you want to show off your musical talent as a musician, band, or artist. It’s also useful for Music companies to keep tabs on all of their Artists and Events. 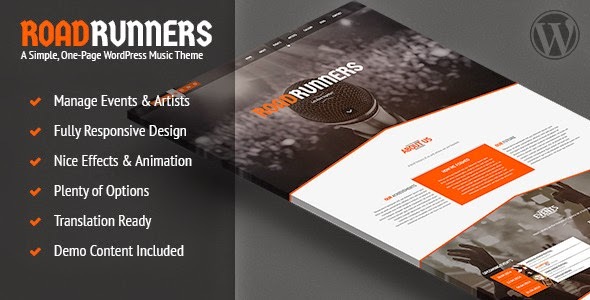 Item Reviewed: RoadRunners A One Page Music WordPress Theme 9 out of 10 based on 10 ratings. 9 user reviews.